LONDON — U.S. President Donald Trump's family business partially destroyed legally protected sand dunes in Scotland when it built a golf course north of Aberdeen, according to government reports released in response to a freedom of information request. Scottish Natural Heritage, which monitors the country's sensitive and scientifically important sites, said that construction of Trump International Golf Links Scotland "led to the direct loss" of up to 68 hectares (168 acres) of the 205-hectare Foveran Links site. The damaged and destroyed drifts, one of the best examples of moving sand dunes in Britain, developed over 4,000 years, according to the agency. 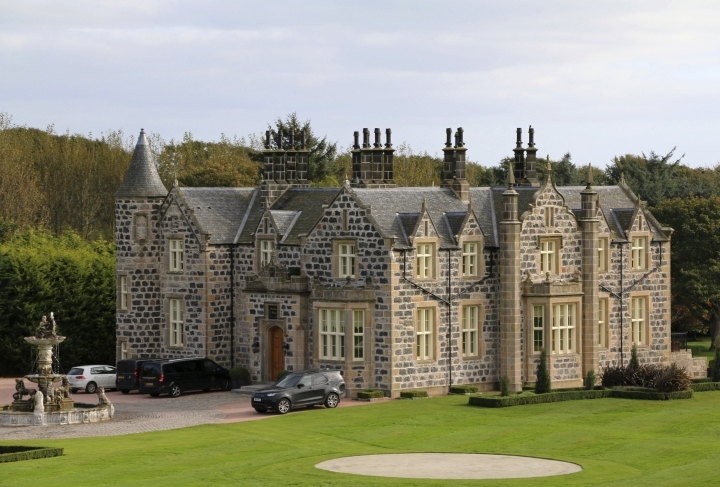 "The construction has removed the vast majority of the geomorphological interest within the vicinity of the golf course," Scottish Natural Heritage said in the documents. The documents were released following a public records request made by Bob Ward, policy director of the Grantham Research Institute on Climate Change and the Environment at the London School of Economics. Britain's Observer newspaper first reported the studies. Trump International Executive Vice President Sarah Malone said the company owned less than 5 percent of the site of special scientific interest, or SSSI, most of which remains untouched. "As for the small portion that we do own, no other SSSI site in the land has seen more environmental care or investment," Malone said in a statement. "The site was ignored until Trump took ownership, and is now celebrated and enjoyed by many." As for the land developed for the golf course, "it has changed in parts because we have sown grass, but our environmental consultants and (Scottish Natural Heritage) can confirm that many of the special attributes of the land remains and the wildlife is flourishing." The golf course was completed in 2012 and is part of what the Trump Organization envisions as a larger project that could include two golf courses, a 450-room hotel and as many as 1,500 homes. Scottish authorities approved the outlines of the project in 2008, though each phase will require additional review. The company last week unveiled plans to invest 150 million pounds ($196 million) in the second phase of development. During the original approval process, Trump promised to minimize any environmental damage, saying he was "fully committed to mitigating the effects of the course on the environment." Ward said the Scottish government should consider Trump's failure to live up to the commitment when it reviews future building plans for the site. "I think the problem here is the disregard they've shown and the way in which they made promises which he has not kept," Ward said. "I think personally that the Scottish government here has not been as strong as it should have been in holding Mr. Trump to account, and I hope that they will now see the need to do that." Critics in Scotland previously accused the Trump Organization of failing to deliver the jobs and investment it promised when the project first came up for review. The proposed second phase will support nearly 2,000 jobs during construction and some 300 permanent jobs after it is completed, the company said last week. Foveran Links is one of the "least disturbed and most dynamic" dune systems in Britain, which makes it important for studying the natural features of the coastline, according to Scottish Natural Heritage. "Essentially, what has happened now is that future generations of geologists and geographers won't be able to go and visit the site," Ward said. "I find that inexplicable."